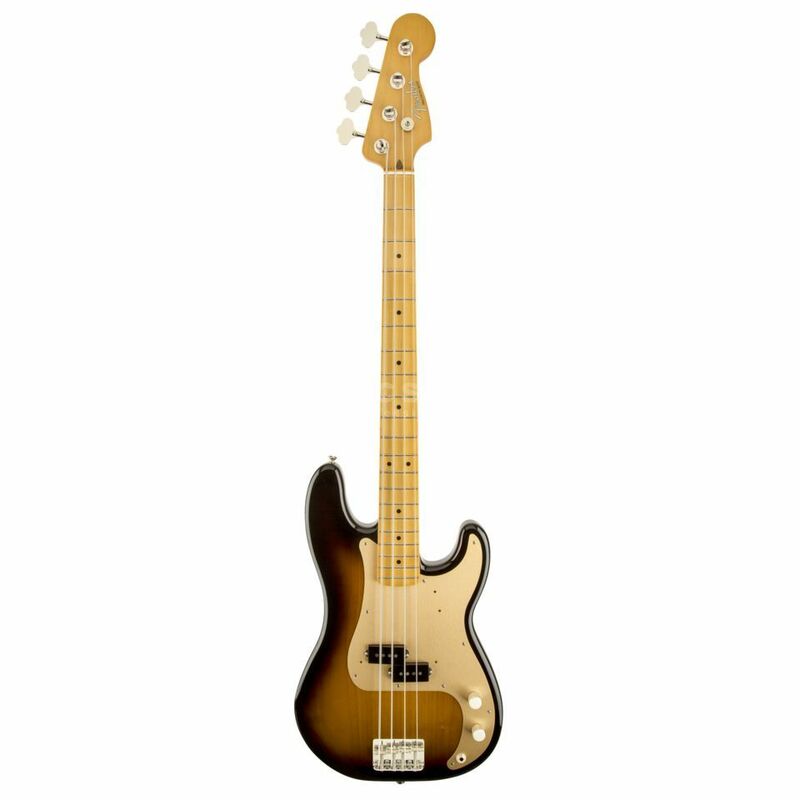 The Fender 50S PRECISON BASS 4-String Bass Guitar, Maple Fingerboard, 2-Color Sunburst. Superb P Bass with a comfortable neck, retro styling, rock solid punch, fat bottom end, an affordable alternative to the '57 P Bass. The Fender 50s Precision Bass guitar is inspired by some of the most legendary basses of all time! The ’50s Precision Bass features a maple neck, alder body and a split single-coil Precision Bass pickup. Other features include a gold anodized pickguard and vintage hardware. This bass has all the great Precision Bass features you need, super comfortable neck with a great action, tone to fit most styles and a lightweight alder body. This bass rocks! It grooves like no other! It can do all sorts of modern stuff or old school heavy stoner rock, grunge, alternative, indie, funk, metal, you name it! Truly awesome sound from the rather hot pickups, aggressive yet well defined at all times, cuts through ANY mix! Classic P sound in a very very very well crafted instrument. Dont be fooled by the MiM tag, this thing looks and feels like an instrument worth 3-4 times the price! Both the vintage neck tint and the 2 tone sunburst are to die for! Its also on the light side, mine is less than 4kg. The only con I could think of is the width of the neck at the nut. Its indeed quite wide even for a P (~45mm) but it has a nice C profile and feels very comfortable to play, and rather thin front to back. Unless you have small-ish hands I dont think youll find it uncomfortable to play (just for reference Im 1,83m tall and my hand is 20cm measured from the base of the palm to the edge of the middle finger). All in all, this bass is an amazing value both sound and quality/craftsmanship wise, well worth the price!! Get one yourself, now!